Last weekend, my family and I had few guests over for dinner. I was seated at the dinner table, eating in one hand and scanning my iPhone for Facebook & Twitter updates with the other. Suddenly, my dad says "Eat your food first". What an awkward moment, I have to admit that I couldn't go 15 minutes without checking my phone. This wasn't because I was expecting something important but I just didn't want to be the last one to know about something. Sounds familiar??? You are not alone; you and I might be suffering from the Fear of Missing Out syndrome. Without a daily dose of "share", "status", and "likes", some people may seem to feel incomplete and frustrated. We all have experiencedFOMO or Fear of Missing Out. It seems to happen when we begin to feel anxious about not being able to attend social events. According to Arnie.Kozak, a Psychologist and author of Wild Chickens and Petty Tyrants, FOMO happens when we invalidate the experience we're having because we're obsessed with the ones we're not having. This is associated with a perceived low social rank which can cause feelings of inferiority and anxiety. Research suggests that FOMO takes a toll on the psychological health of individuals. People have constant fear of missing events which can cause anxiety and depression especially for young people. In very extreme cases, such social insecurities can contribute to feelings of shame and violence. 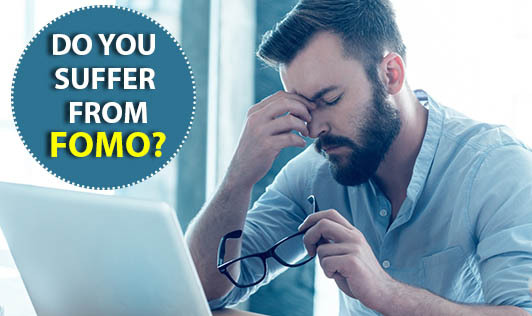 FOMO is most common in people aged between 18 to 33 and a survey also suggested that it is more common among men than women, though it's unclear why. "FOMO prompts people to use social media to present enviable versions of themselves," says Turkle, and this behaviour can seriously mess with your head: "One of the weirdest things about FOMO is that people find it hard to live up to not only the images projected by others but also the image they've presented of themselves." Psychologists have also suggested that FOMO helps drive the success of social media platforms, since we feel we need to use the technology to let us know what's happening elsewhere. Whereas, in some cases, FOMO may actually give us positive motivation to socialize with friends. Seema Hingorrani, clinical psychologist and author of Beating the Blues, said, "As technology advances, FOMO increases. It has a direct link with information overload in the brain." The advice to those suffering from FOMO is simple: "You have to accept that not everyone can do everything." Hingorrani suggests reducing the time spent seeing what others are doing and focussing more upon yourself. "Don't believe and scrutinise everything that you see. Instead, introspect and accept yourself the way you are," she said. "The person who is most active on social networking sites is often the most lonely," she added. There are few things that are actually important in life, they cannot wait. I understand if you are the President of India- then you have a justifiable reason to check your texts during dinner. Whereas everyone else, not so much. We fail to resist our FOMO when we do so. This FOMO is starting to spread throughout our social relationships and we need to question ourselves. Will we ever just think and settle for things that we have, rather than stick to the fear that we may be missing out on something superior? Social networking sites such as Facebook and Twitter seem to be making this increasingly more complicated and difficult.